(Phys.org) —A trio of researchers working at Flinders University in Adelaide, Australia, has found that bee populations in tropical climates may hold the key to assuring food for humans as the population grows in the future. In their paper published in Proceedings of the Royal Society B, the team describes how in studying bee populations in tropical zones over ice age cycles they've found that those that adapted may provide the key to future adaptability of humans as more food becomes necessary to feed a growing population. Scott Groom, Mark Stevens and Michael Schwartz, have together been studying bee populations in tropical climates, in particular, those of bees that reside on Fiji, Vanuatu and Samoa. Their studies have led to models that represent bee populations during the time of the last ice age and after. They cite evidence that suggests that bee populations declined significantly during the last glacial maximum (LGM), due to colder than normal temperatures. Their evidence also suggests a major rebound after the ice receded, but not in ways they expected. They found that as global temperatures warmed, some of the bees retreated to higher elevations (where it was cooler) to maintain their way of life—others however, did not and instead adapted to the new warmer temperatures and their descendants now make up the bulk of bee species alive in such tropical places today. It's the resiliency, or plasticity to change in the bees that adapted, that the trio claims is important. Prior research on plant and animal response to an earlier ice age, and what happened after, has focused, they say, mostly on species that were more directly impacted, e.g. those that lived in areas where glaciers developed. Most such studies have ignored tropical regions such as the Southern Pacific, including archipelagos, or on important fauna that are vital to the survival of other species, such as bees. When such populations decline, they note, populations of other plants and animals fall as well. 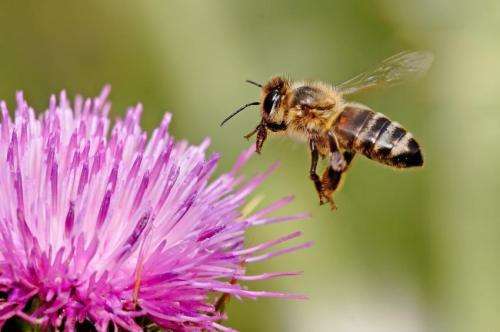 It's for this reason that the team suggests that more research be conducted on bee populations that adapted after the LGM to better understand what might be done to encourage such adaptability in modern species, especially in light of dramatic population die-offs due to colony collapse disorder. The impacts of glacial cycles on the geographical distribution and size of populations have been explored for numerous terrestrial and marine taxa. However, most studies have focused on high latitudes, with only a few focused on the response of biota to the last glacial maximum (LGM) in equatorial regions. Here, we examine how population sizes of key bee fauna in the southwest Pacific archipelagos of Fiji, Vanuatu and Samoa have fluctuated over the Quaternary. We show that all three island faunas suffered massive population declines, roughly corresponding in time to the LGM, followed by rapid expansion post-LGM. Our data therefore suggest that Pleistocene climate change has had major impacts across a very broad tropical region. While other studies indicate widespread Holarctic effects of the LGM, our data suggest a much wider range of latitudes, extending to the tropics, where these climate change repercussions were important. As key pollinators, the inferred changes in these bee faunas may have been critical in the development of the diverse Pacific island flora. The magnitude of these responses indicates future climate change scenarios may have alarming consequences for Pacific island systems involving pollinator-dependent plant communities and agricultural crops.